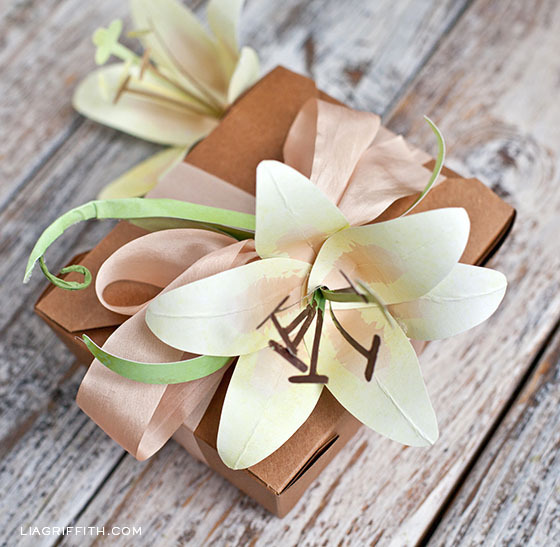 Simple DIY Paper Easter Lily Tutorial and Pattern to Make Today! Happy St. Patrick’s Day Monday everyone! Did anyone else enjoy the spring sunshine this weekend? Today I am going to share the pink and yellow watercolor lily template. I originally made this a few years ago, but was saving it to post for the Easter season. This is one of the few paper flowers I make with a card stock. I now have a paper lily flower tutorial in crepe paper, a potted lily of the valley and a crepe paper calla lily tutorial. 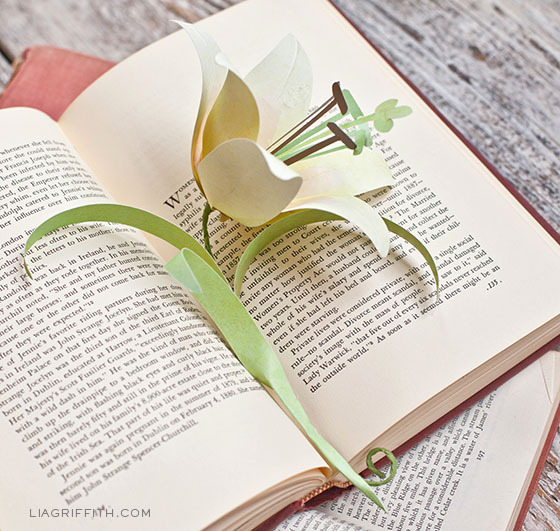 Since the petals are large and few, the extra thickness works well with this paper flower. The template below includes both a front and back print of the flower, so you will see color on both sides. 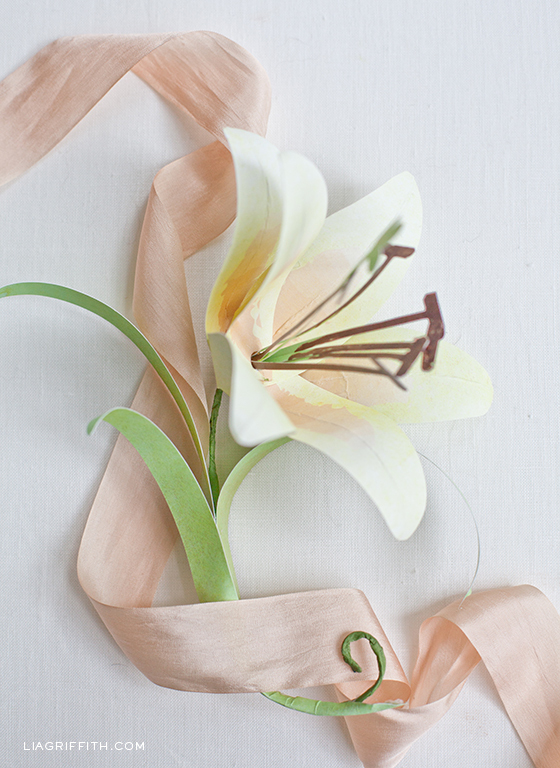 Just follow my step-by-step tutorial and you will find yourself with a pretty spring lily to use for a gift topper, to decorate your Easter table, or to enjoy at your office. Is there an SVG file for this? I’m dying to make an entire bouquet of these, but they are a bit labor intensive to hand cut. Was an SVG ever created for this? I just love your flowers, and with my ùCricut explore it’s so easy to cut them out! I’ve made your hydrangeas and roses so far. Do you by any chance sell a cut file for calla lilies? if so, where could I buy it? Thank you for making these, and all your paper crafts. You have inspired me to try new things, and as a retired/disabled RN, given me things to do with my brain and hands again. Thank you with all my heart and brain. I don’t usually post, but I have to say your work is excellent! Very fresh and clean. 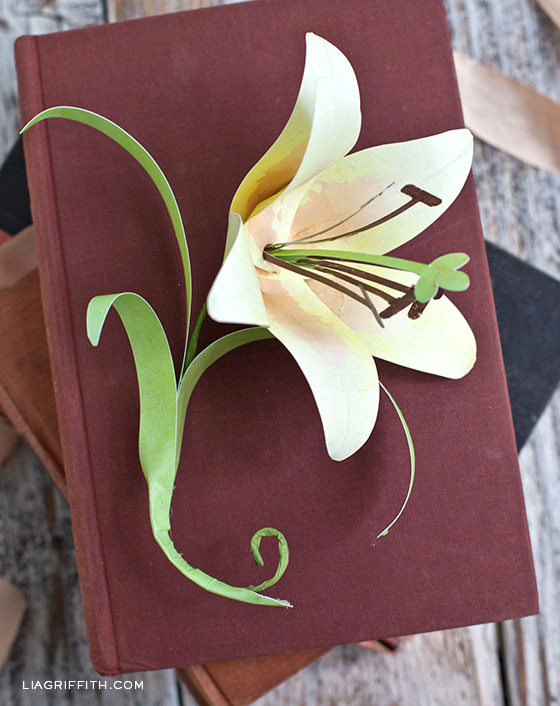 I’ll be making lilies this spring. Thank you that warms my heart! Thanks for sharing I love your work. Hi, there! I am a school teacher. Lia, thank you very much for your paper flowers, I have used them as decoration on most of our school programs. I just wish to ask if there is a lily template in black and white, so can print it out in colored papers. can this be done with crepe paper ? Sure! I will be making a crepe lily at some point too. This is pretty, be a nice way to wrap a present. I love topping gifts with paper flowers. I’m amazed every time I see a new flower from you. It is beautiful! Lilies are one of my favorite flowers but the smell of them has been bothering me lately as my allergies are intensifying with age. These would be perfect for me! soooo lovely!! I have to try it!! thank you very much for this beautiful post! regards from Spain! I adore your paper flowers! I’ve put together a bouquet for the office front lobby 3 times already and they got rave reviews. Looking forward to doing a dozen lily’s for April. Thank you! Wow Jane! I hope you took photos of your bouquets. I would love to see them. Share on my Facebook page! Oh, what a beautiful paper flower! So delicate-looking, Lia! Love this! Your flowers have been so amazing! I am hoping to try a few of them to make my own wedding bouquet for the fall. That would be just gorgeous mixed in with a few other paper flowers too. Very pretty, Lia. Thank you! Handcraft your Life rocks! I love it. Sooo doing a bunch to use as my table centre piece for Easter. Thank you so much Lia. Thanks Rhoda! That will look just gorgeous and be something your guests will get a kick out of! What a beautiful Lily, Lia! Your so creative! Thank you for sharing the file and great instructions. Now, I need to find some time to make one 🙂 Have a great week! Wow, that’s awesome!!! Thanks so much!